Sorry for the low blogging of late. I’ve hit the opposite of a blog-drain; I’m in a state where there’s simply too much to write about, and instead of just exploding with it I retract into myself think I should mull on it a bit before I pop it out. Today is one of those popping days, and I want to talk about something that has been new to me for the last 5 months or so and has proven itself to be a mixed bag of pro’s and con’s ; working from home. As of the beginning of this year I started to work for Free Systems Technology Labs, an Indian company bent on doing funky stuff the right way with the right people (I had to say that, didn’t I? 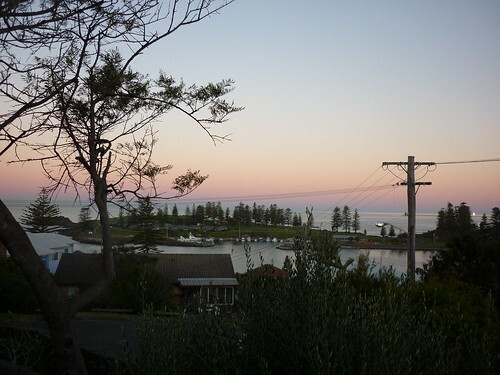 ), and as such I now live in my wife’s home-town of Kiama, a couple of hours south of Sydney, Australia. We moved here from Norway at the beginning of the year for a number of reasons, but being closer to (my wife’s) family also with little kids and the nice climate were two strong contenders (but we’re still talking about moving back to Norway someday… or somewhere else entirely, wherever fate and lust drives us, really). Working from home can be boring, I know, but we’re actually living in a 1880’s built old two-storey farmhouse, verandahs all along the house, with some of the best views in town. Here’s a pic I took last evening before finishing up work for the day. Yes, it can be hard concentrating on hard-core ontologies and magic Tuple-stores when you can stare at the sea for hours, and it doesn’t help either that there’s a number of comfy chairs with fluffy pillows right outside my French-doors that leads out to the verandah. Especially on a nice sunny day. Like today. So, in order to break up my day I’ve got a schedule of sorts. First, after the kids are out the door for school and breakfast is tidied up, if I still got tea left I bring it upstairs to my office. Now here’s a crucial part of my day; do I sit down and get started, or go and get dressed? Ah, the number of times I’ve written important emails or talked on Skype in my underwear. Well, the sensible thing to do – and, really, what I try to do every morning – is to get dressed. I know it sounds pathetically lame to lament over this, but it’s so easy to just get going. I’m not going anywhere, right? Well, that’s the thing. Part of my schedule, which I don’t do absolutely everyday, but every so often, is to go to my local coffee-fixer-upper-place. I gives me an excuse to get dressed, and makes for a nice 2 minute (!!) 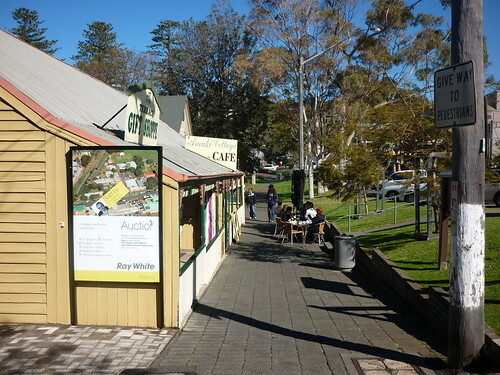 stroll down the picturesque Kiama town-houses, all the way to the bottom of the hill to get my double-strength coffee, double-strength chocolate Mocha. Some days when I do my walk on lunch time, I might even get one of their amazingly yummy salmon on Turkish-bread, and just stroll another minute down to the park, sit in the sun on the grass, and enjoy the serenity. Of course, too much serenity is kinda boring, especially when your mind is racing with ontologies, event-models, dual-stored Tuples, or worrying if I need to consider using Bessel functions for subject equality in the Topic Maps Reference Model, it can get a bit busy in my head. Thankfully when the day is over I’ve got a way to kinda deal with all that, but during the day itself it’s sometimes hard to focus on just one thing and one thing alone. So I need to schedule even such things. I do have a schedule, though. 9am – 10am is the time for all things not specifically work tasks related, such as emails, news, blogs, etc. At around 10.30am till about lunch I do the more practical things about my work, such as coding, writing, testing, dowloading and installing, meddling, fiddling, prototyping and breaking my machine. Then I have lunch, quite often with my wife who downstairs somewhere chasing Samuel around, trying to stop him from getting into stuff he shouldn’t. And then after lunch, at about 1pm, I fix my machine and do more thinking-related stuff, hold meetings (mostly through calling through Skype at around 2-2.30pm when India is getting into the office), write emails, and try to come up with plans, thoughts for the next day, and scheming in general. I try to follow this pattern as much as I can. It’s a lonely job in many ways as I don’t have that office intermingling that I love. So, to keep myself sane I go places. I often go to the Kiama Library where I meet up with Tim, the crazy-fun-beardy local IT librarian. I sometimes meet up with a few guys I know around the place (not that many) and even got to meet up with Murray Woodman from Sydney the other day. As often as I can, at least once or twice a week. And then, just like in over a week or so, I go to India (Bangalore mostly, but sometimes Mumbai) for 10-12 days to do an intense stint of socializing, hacking, planning, talking, planning, teaching, drinking excellent Chai tea, more planning, around the clock until I don’t know what day it is (which suits, given the jet-lag). Then back home for another 2-3 months of working from home again. It works. It’s not perfect, but it sure beats living a crazy stressful life in a big city where you don’t have control over your surroundings. 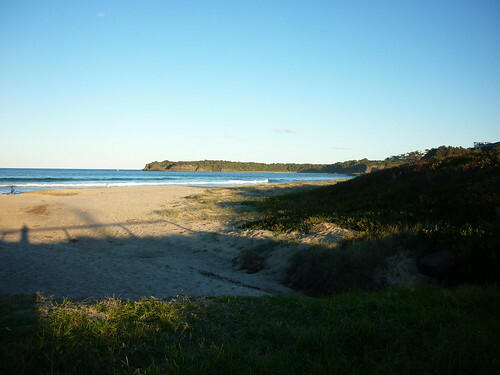 Here, if I’m stuck with something and need a break, I put on my slippers, open the door, and walk 4 minutes to the beach. All is well, and when I get back I know for sure that implementing the Bessel function in my Topic Maps Reference Model is an excercise for the modeler and the TMDM engine, not for the technical implementation itself. Problem refreshingly solved. Oh, and do come and visit. I’ll buy the coffees. Where in the world is Alexander? Longer answer; my new employer which I started with a couple of months back is an Indian company with strong ties to back-end systems and support, hardware manufacture and design, and software services. I’ll tell more as things progress, and I’ll probably talk a lot more about how they plan to use Topic Maps to solve some really crazy and hard problems. But before I do those kind of detailed stuff, I wanted to just quickly show you this picture which pretty much summarises my first impression of this crazy, lively, contrasting, weird, interesting place, and if you can’t read the sign, it says “Follow traffic rules.” I realise that in India, if you ask kindly, they just might do what you ask, but riding as a passenger in a car through this traffic was, err, an experience I won’t forget anytime soon. However, it’s interesting that in a language such as my own (English, or Norwegian, or Swedish, or Danish) we base our expression mostly on words alone, while in India the reason traffic works is that they’ve got such a strong foothold in semiotics that makes it work. A honk here, two honks there as we pass a car, a blink of our beam lights racing past a “moto” (small scooter that’s kinda rebuilt as a tiny car) … I still have much to learn about this language. The cool thing is that it’s global; even I can do it. Except I would never drive here. Never. Ever. Anyway, I’m in India to train staff and meet and plan with them in all things black magic and drink their excellent Indian tea and eat their amazing food, and generally get a feel for the country, the culture, and most importantly, the people I’m working with, which so far has turned out to be a fantastic bunch. I’m here for another week or so, and I’ll suss out the details and let you know all about it in due time. Until then, there’s a chapati drenched in yummy chutney with my name on it. India is, truly, an amazing place. P.S. Hey Barta, where can I get my sweaty hands on your TM as a filesystem? Would love a play with it right about now. Oh, and that near NLP query stuff you mentioned that one time in the back-alley while drinking gin and discussing the meaning of wife. Or life. Or whatever.